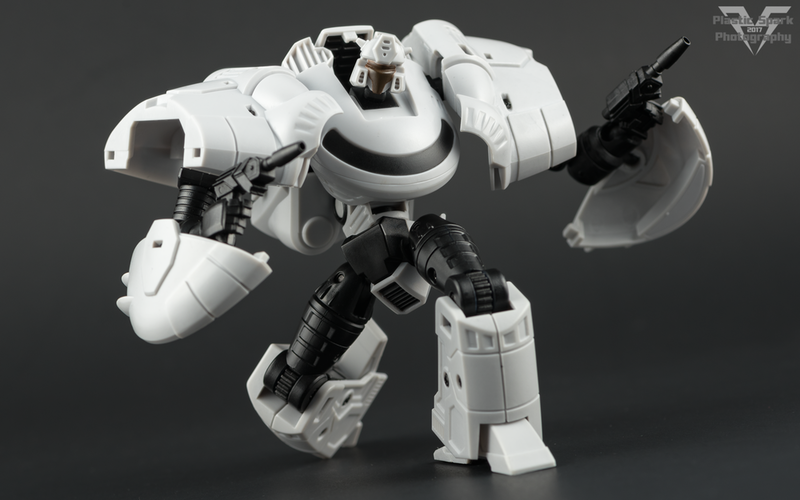 Newcomer to the third party scene MAAS Toys released their first figure Skiff, a War Within inspired take on Bumblebee, to a fairly warm reception. Not one to go out of my way for the little yellow bug bot I was a lot more interested in some of the exclusive variants being made. Along with Skiff came Gold, a Goldbug inspired repaint with a battle mask head, Rune, a Glyph inspired repaint with a new head and a gorgeous blue paintjob exclusive to TFNation in the UK, and lastly Volk, a cold primer grey variant with a battle mask. 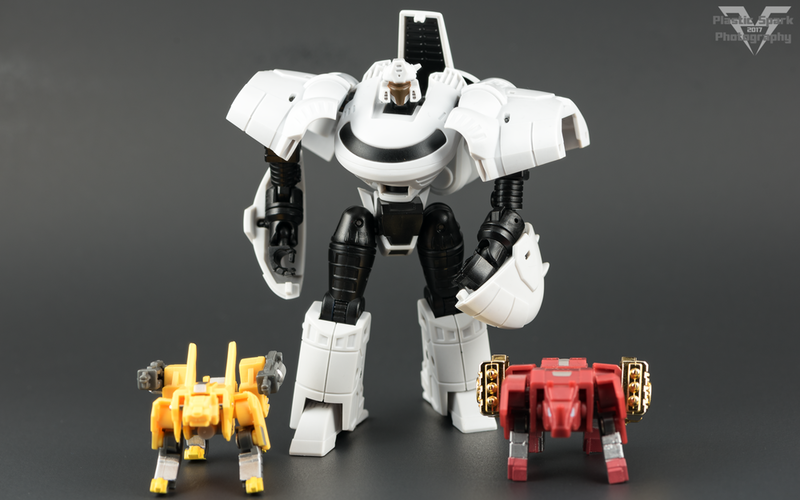 Initially I thought this prototype style deco to be a reference to Bugbite, the white G1 Bumblebee variant. I have learned recently that he was in fact inspired by the Silver Estrela G1 Bumblebee variant “Volks” released in Brazil. 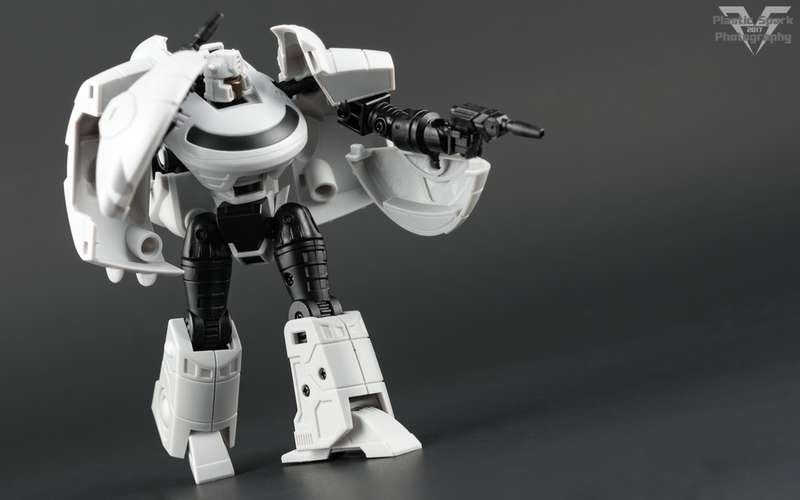 You can read more about this variant in an older article by Maz from TF Square One here. For my collection, I view this as Bumblebee, upgraded with an advanced camo system to enhance his spy capabilities. Perfect for tracking down the Decepticons and their plans on Cybertron! 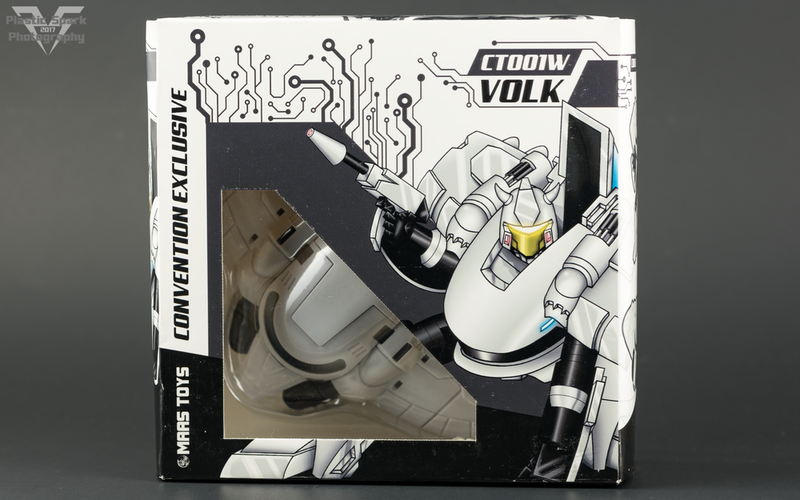 Volk was released as a Convention Exclusive through Ages Three and Up. I purchased mine from them at CollectorFest-Calgary. The listing is still live on their site, however at the time of this review they appear to be sold out. Keep an eye on the page if you’re interested as they might restock in the future! Volk’s alt mode is heavily influenced by the Cybertronian designs for Bumblebee featured in “The War Within” comic book series, as well as the first episode of The Transformers animated series. Bumblebee was depicted as a sort of hover wing/glider car with a thin wide oval shape. Volk and his mould-mates replicate this design to near perfection and they’ve even included little wheels on the bottom to roll him around on your desk! 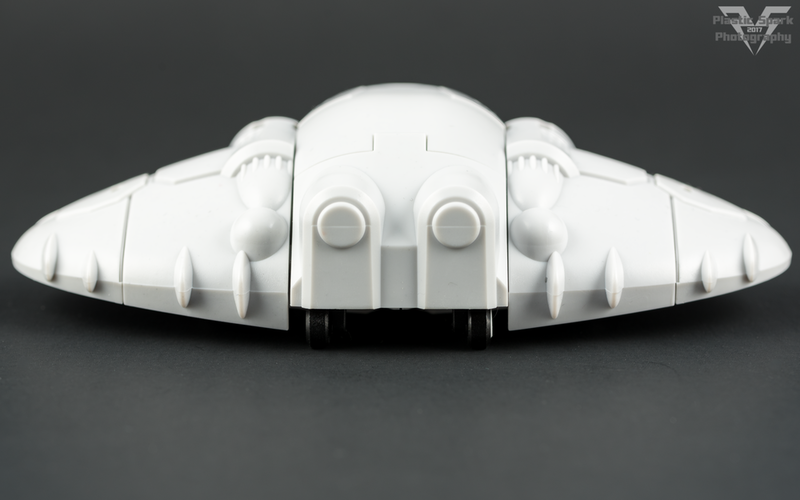 The wheel position allows the figure to appear as if it is hovering when viewed from the proper angle. As many others in the community have noted; There are some serious similarities with Samus Aran's gunship from Metroid. Seems to be plenty of customizing possibilities here! 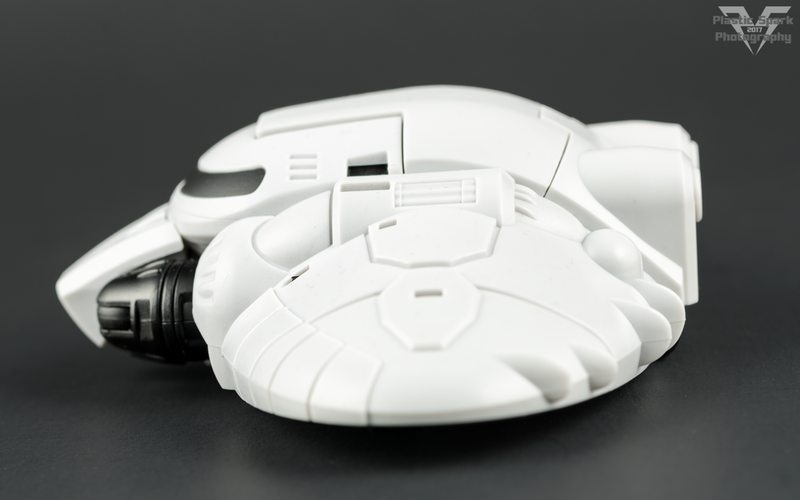 Volk is covered in a lovely amount of sculpted tech detail and design. 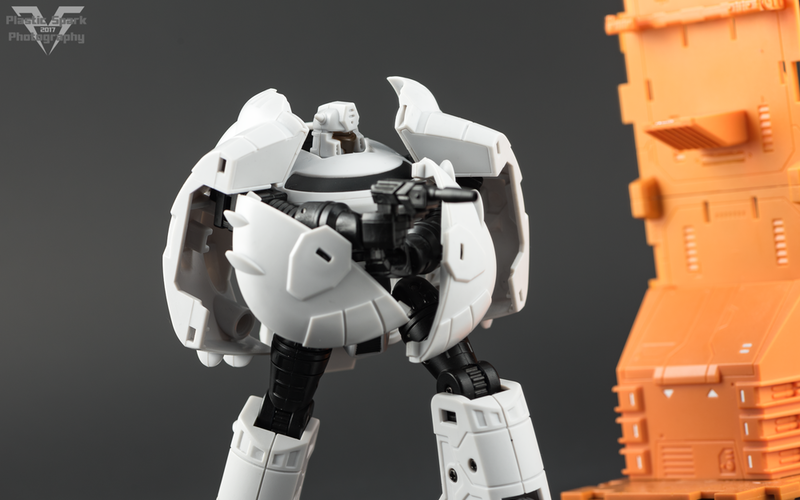 The robot thighs are exposed in this mode but they act as the sort of front end of a turbine on either side of the center mass. I felt this was a bit lazy at first glance but once I saw how the detail blends in with the sculpted engines on the rest of the body I actually really enjoyed the design choice. From the bottom all kind of robot bits are visible but let’s stop pretending that’s an issue. If you’re displaying your robot toys upside down in alt mode, then this ain’t the one for you I suppose. There’s weapon storage under there too which I totally dig! 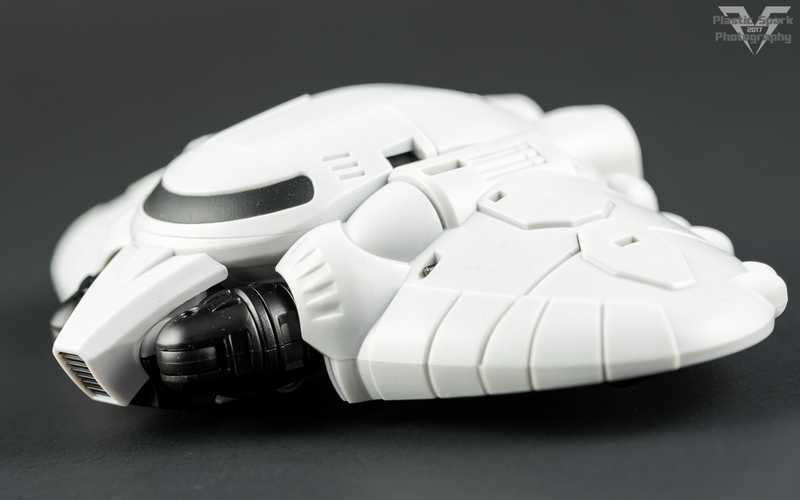 There are tiny black guns molded into the body on the outside of the engine casings, You can also cheat a bit and get an attack mode out of him by separating the ends of the wings and sliding the guns into his hands. Pretty sure I saw TF Square One do this first on Twitter, so kudos to him for that one! Volk has an incredibly satisfying transformation in either direction. No instructions were needed, nor were they included. Instead there is a QR code link to a video instruction manual if you find yourself lost during the conversion process. Volk converts into a bulky space bot that is deceptive in his functionality. He takes some play time to really learn the intricacies of his articulation, and how to navigate around those enormous shoulder pauldrons. I spent two nights on the gallery for this review and the first night I was so tired and getting very frustrated trying to pose him. The second night, it was like a switch flipped and all of a sudden the frustration I had the night before disappeared and I hit a groove shooting this guy for hours! I guess what I’m trying to say is that, if at first you are a bit thrown off by this toys functionality, give him some more play time and see if something clicks for you too! Paint is very minimal but effective. There’s a gorgeous flat black applied to the windshield of the alt mode/bot mode chest, the front grill, and the underside of the backpack creating a great contrast between the backpack and his head. Volk’s face plate and visor are both painted with a dark chocolate brown and the battle mask paint is applied in a sort of “Y” shape giving it a more aggressive look. I think a different color for the visor would look good to separate it from the faceplate, maybe a dark red, or to keep it on topic with the original “Volks” variant a shiny gold visor would look great. 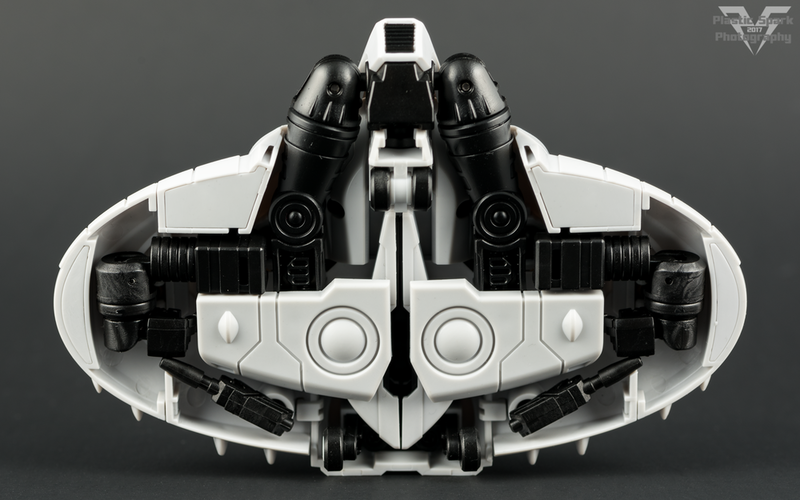 Volk includes two small blasters, moulded in black with some G1 referential detail. These blasters can be stored on the underside of his shoulder armor as they are in vehicle mode, or held tightly in his hands. The handles are a rectangular peg that fits the circumference of Volk’s hands perfectly. The guns could use a bit of weathering or even moulding in a different color to help them stand out. Articulation is really nice on this figure, but not the most straight forward setup. From the top down we have a 2 axis swivel at the neck, allowing for a full 360 degree rotation and he can look straight up. Not much downward tilt but this guy isn’t looking down on many bots so not an issue. The shoulder armor is mounted on ball joints, attached to rigid stalks in the chest. 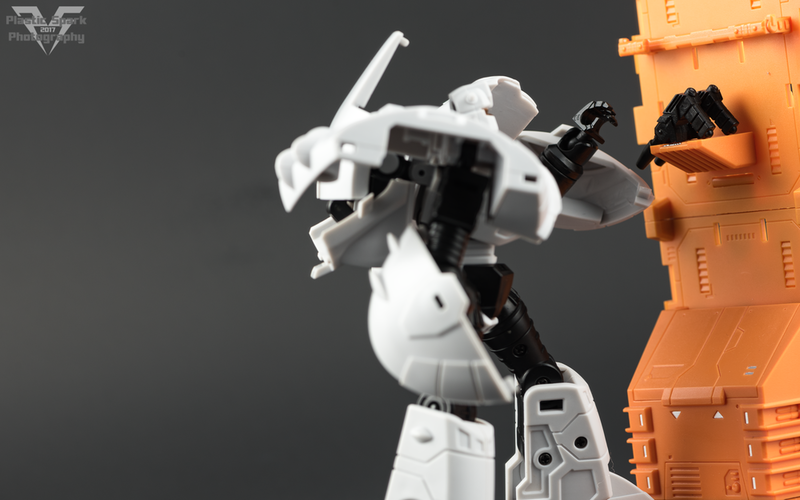 The shoulder armor is the basis of the arms articulation and the ball joint here allows for a huge range of motion. The actual shoulder of the arm is mounted on another ball joint, attached to a moving strut underneath the armor. Using this strut you can place the arms closer or further from the torso, to your liking. 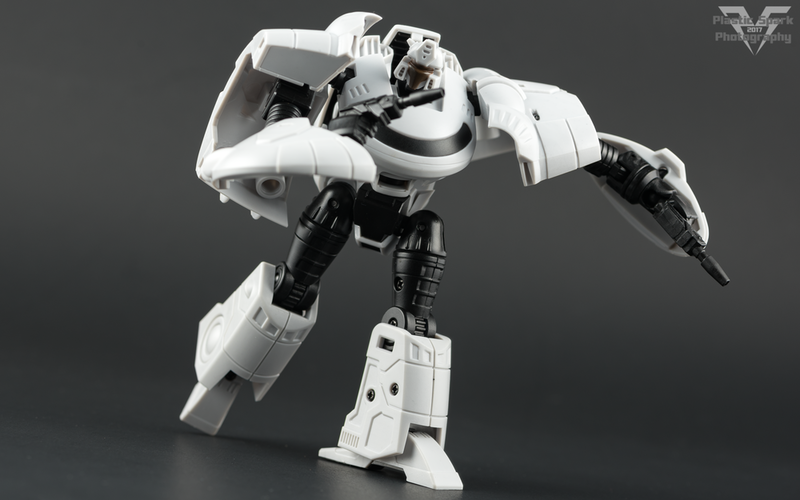 Bicep swivels, single hinge elbows, and ball jointed wrists finish off the arms. The robot mode kibble on the arms can be a bit tricky to deal with but the combination of ball joint, and ring swivel on the arm allow you to get those pieces in to almost any position. It would have been nice to see a cleaner solution for these panels but again, it’s not a deal breaker for a figure of this style and size. Volk has a wonderful forward ab crunch thanks to his transformation, as well as universal hips with free range in all directions, tight thigh swivels, and a single hinge knee that hits 90 degrees. You can cheat and get a little more out of the knee buy reversing the transformation on his boot a bit, but you can only go so far before it looks completely unnatural. I was incredibly impressed with the fact that Volk has great forward/backward foot tilt and a competent ankle tilt. Given the design of his “Space boot” style lower legs I thought for sure those feet would be locked in an A-stance, consider me very happily proven wrong. I am impressed by a toy that I frankly didn’t expect much of. I picked up Volk as a con curiosity, and found him to be an incredibly fun desk toy that I can’t stop picking up and converting. For a first outing from MAAS Toys I’m incredibly impressed. This design, as well as the final product’s in hand quality, shows that an experienced team is handling this toy line and I can only imagine things will be getting better from here. 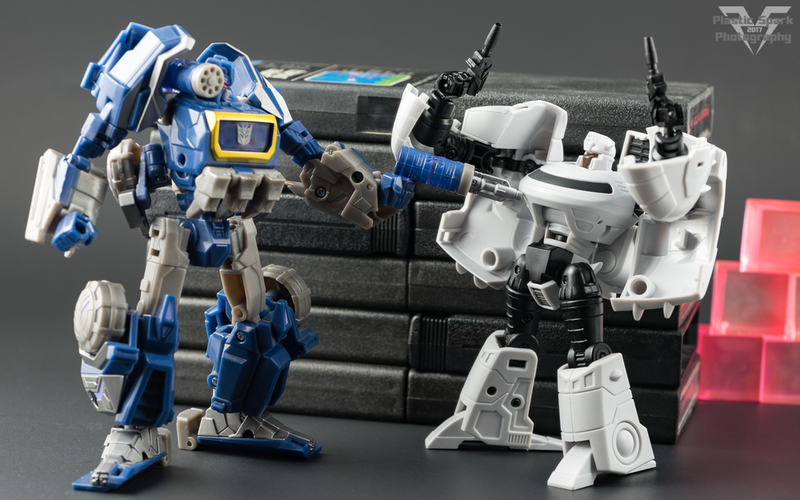 I’ve seen pictures of their prototypes for Stack and Speed, (Cybertonian Pipes, and G2 Rapido homages respectively) and I’m quite interested in seeing the direction that this company is heading in. They’ve also shown renders of Starscream and his squadron, combining the Tetra Jet Cybertronian flight mode with a more G1 toon style robot looks to be a blast! This is an incredibly fun toy that I can not put down. I even brought him to work with me and showed him off to all my coworkers! I definitely recommend Volk, and by extension, any of the variations, on the condition that you can pick them up for retail. I paid $50 CAD for mine, which is MSRP, but is a bit high all things considered for essentially a small deluxe bot. I can forgive the cost from a new company as I know there is a ton of capital up front required to make toys like this happen for the community. I’m liking that their other releases are looking a little bigger and a little more fleshed out, and hoping that they will fall into a similar price point. I expect big things from MAAS Toys and I think they have what it takes to carve a mark in the third party market. 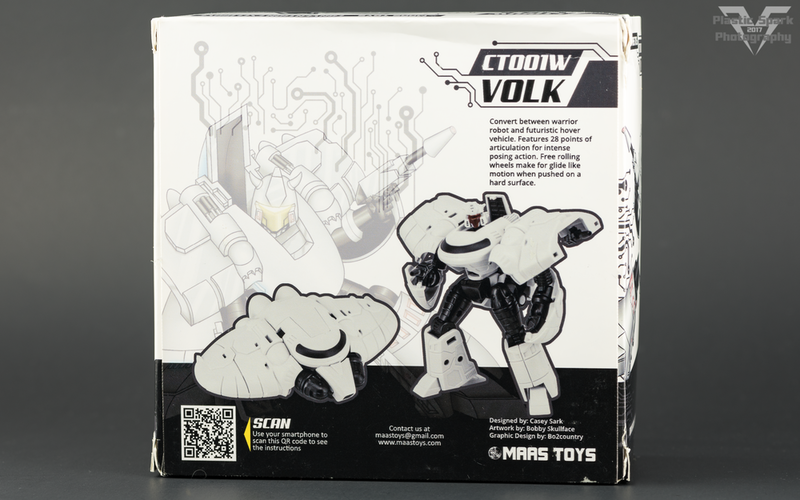 Thank you so much for checking out my review of MAAS Toys CT001W Volk! Don’t forget to check out the Facebook page and leave a like if you haven’t already! I’m really hoping to hit 1500 before the year is through!